Have you ever heard of a wine chilling bag? 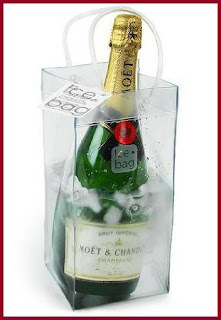 Well, before last summer, I did not know that I needed a wine chilling bag (apparently they are called ice bags here)! But, after a trip to France, where almost every outdoor cafe served our wine bottle in one of these clever plastic bags, I knew I could NOT leave without one! So it's pretty basic, you fill this cute little bag with ice and water, then you put your wine bottle inside to keep it chilled. 1. It looks like a shopping bag, with handles, it's totally cute! 2. It keeps the bottle chilled and does not take up much room on the table. 3. When you are not using it, you fold it up and it takes NO space to store. 4. It is great for a picnic or outdoor use, it's plastic! around with you, in a tiny, clear wine purse!!! And at that price, don't even get me started! You need it, trust me!!! Do you already have an Ice Bag? Honestly, I LOVE mine!!! PS. Are you seeing a connection to all of the wine corks?? ?